By Jodi: What kind of lenses do you have for your camera? A lot! I shot this photo using my iPhone so you can see all of them lined up (the list is in no particular order). By Cat: what’s your favorite camera lens and why? I don’t have a strict favorite just because I work with prime lenses (single focal length) so each have their purpose, that being said I am totally loving my 35mm f/1.8 right now. With it getting dark at 5pm I don’t have a lot of natural light to work with and this enables me to shoot wide open, also the focal length is more like a 50mm on my crop sensor (Nikon D90) which makes it just lovely for self-portraits, photos of my boys, and indoor shots as well! It also was a very affordable lens too! By Jennifer: How did you get started in photography? I can’t really remember! I started out with a 110 film camera (sadly ALL the photos I shot up until I was 18 years old are missing/stolen ugh) but I suppose I started taking it SERIOUSLY after I had my oldest son. By Jennifer: How did you decide on a Nikon camera vs. Cannon? I compared peoples photos. I liked the colors that Nikon was getting out of camera over Canon and the Nikon bodies just FEEL better in my hands. By Lise: My sister recently graduated as a photographer and it’s really hard to get a job in Canada’s capitol city (Ottawa). Any good advice for a fellow photographer? Ah this I have no advice for as I’ve never done photography on a professional level but hopefully someone will see this and leave some suggestions! By Renee: I *am* curious as to what you recommend as far as lens cleaning kits & hoods go. I rarely use a lens hood however I do like the flexible rubber lens hoods. Lens cleaning? My husband cleans my lens for me! I’m rough on my gear (which drives him crazy!) so he uses a microfiber cloth to remove any dust or lint that my rocket blower leaves behind. So, for those of us not yet in the DSLR zone, what is the difference between your lenses? Or, more simply put, what photo would you take with said lens? Most of my lenses are called PRIME lenses which means they have a single focal length. 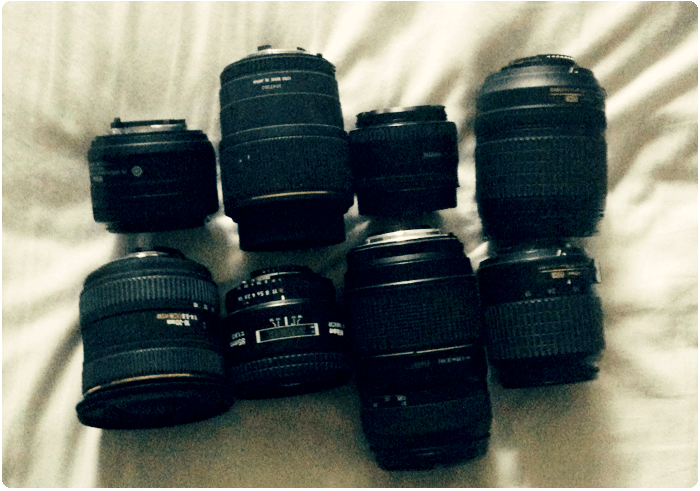 105mm, 85mm, 50mm, 35mm are all prime lenses. The smaller the number the more “wide” it becomes, the more everything… fits in the frame. The LARGER the number, the tighter it becomes, you can only fit a few things in the frame. A macro lens permits you to get right up on a subject and still get focus. So I use the 35,50,85 for food/portraits/some nature. I use the 105 macro for… macro LOL and nature. I use the 10-20mm for all those lovely wide angle shots of lakes or trees. I rarely use the zoom lenses. That makes perfect sense! Thanks for the explanation. I’d love it if you started writing intro-to-DSLR entries. I think I saw on your website that you belong to clickin’ moms. Have you taken any of their online classes? If so which ones and what did you think of them? I haven’t. Partly due to cost, and partly because a LOT of the classes offered are simply geared towards people photography which I rarely get the opportunity to do. I tend to “specialize” in nature / nature macro because that’s what’s mostly available to me. oooo shiny lenses *grabby hands* i have… a canon. and the lense it came with xD BUT I PLAN TO BUY MORE WHEN I HIT THE LOTTERY!! The 50mm for canon is fairly cheap, less than $150 I believe. LOL my kids don’t really work with me, it’s just a matter of waiting them out! Get the 50mm! It will make a world of difference and yep it’s a prime! Prime lenses are sharper and they are a SINGLE focal length. I have lense envy now. I have two right now, one came standard with my camera, then I picked up a “nifty fifty” which everyone raved about for shooting kids. I just hate not having auto-focus because I have horrible eyes, and I can’t shoot with my glasses on. LOL! I rarely have the energy to shoot, especially this time of year for some reason so my lenses just sit on my bookcase driving the husband nuts. How do you not have auto-focus? I thought you bought the Nikon D5000 correct? I’m actually MORE comfortable shooting with my glasses on than I am with my contacts for some reason. We have just gotten into travel photography and it is so hard trying to decide what lenses to buy. We love the 50mm though. Such a good lense! I’d suggest for travel the 50mm (for people/indoors), a good telephoto zoom 70-300mm and a good wide angle 10-20mm. I’d love to know what type of camera you’d recommend for a blogger who wants to take quality photos but isn’t really interested in being a photographer per se. I do the best I can with my Nikon Coolpix L110 but for quality pictures I will need to upgrade. I really like Panasonic for point and shoot’s that have the features of a DSLR (minus the lens changing ability). You want something that has a good OPTICAL zoom and has the ability to shoot wide open (so an aperture of 2.8 at least if not 1.8).